In February 1869, six people were interrogated in the Armenian administration of Ch’arshamba in the Black Sea region. All cases involved the same issue, namely, living with a second man or a woman without a proper divorce or marriage. Khatug, whose husband was away over a year, was asked why she had gone to Harutyun and she responded: “erig yertal uzetsi” (I wanted to go with a man). 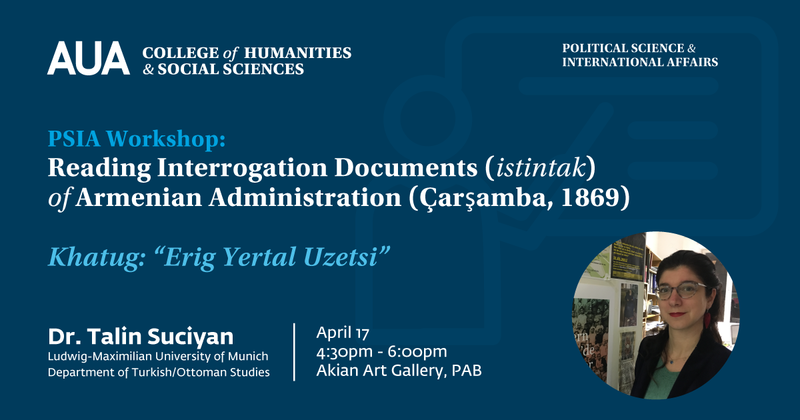 This workshop will discuss the content and structure of an interrogation file from Ch’arshamba, 1869, contextualizing it in the bureaucratic mechanism of Armenian administration in the provinces. The interrogation file of Ch’arshamba reveal completely new historical knowledge with untapped sources on Armenian juridical practices which provide unique information on the everyday life of the villages in the provinces.